The 2018 Daegu Chimac Festival will run from Wednesday to July 22 in Daegu, North Gyeongsang Province. 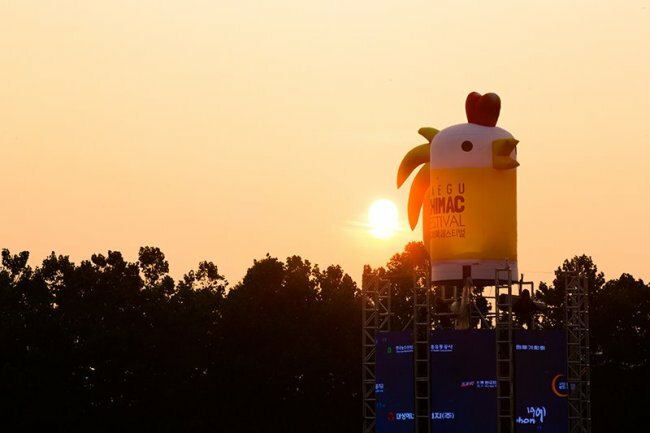 The festival's name is based on a compound word of chicken and beer in Korean that reflects Koreans’ enthusiasm for pairing fried chicken with beer. Daegu started the festival in 2013 with a crowd of 270,000. The number of attendees steadily grew in the following years, and topped 1 million in 2016 and 2017. This year’s event is set to take place at the 1.6-square-kilometer Duryu Park in Daegu. The venues are spread out through the park, with Premium Chimac Club prepared at Duryu Baseball Stadium, where electronic dance music parties are scheduled. Other venues include Chimac Ice Cafe at 22 Memorial Monument Parking Lot, where there will be events for all and “Chimac Live Stage” performances; Chimac Beach at Daegu Tourism Information Center Parking Lot featuring an artificial lawn beach zone with slides and swimming zones; and Chimac Amusement Park, where flea markets will feature handmade craft works, virtual reality sports games and photo zones. The festival is open to visitors of all ages but beer, which takes up half of the festival, is strictly limited to those who are legally of age. Areas such as Chimac Beach need a separate ticket to enter.